This is a bower with a gable and hip-roof shaped like a tent. It's Nanmu wood ceiling is carved with hundreds of flowers. In the centre hang three horizontal inscriptions and a pair of couplets written by Emperor Qianlong (r. 1736-1795). 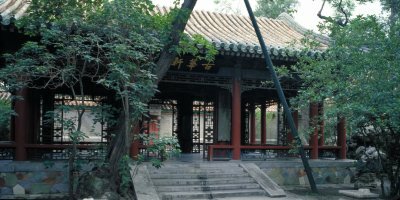 In front of the pavilion is an ancient chinese catalpa tree with very beautiful flowers, for which Bower of the Ancient Catalpa (Guhua xuan) was named.